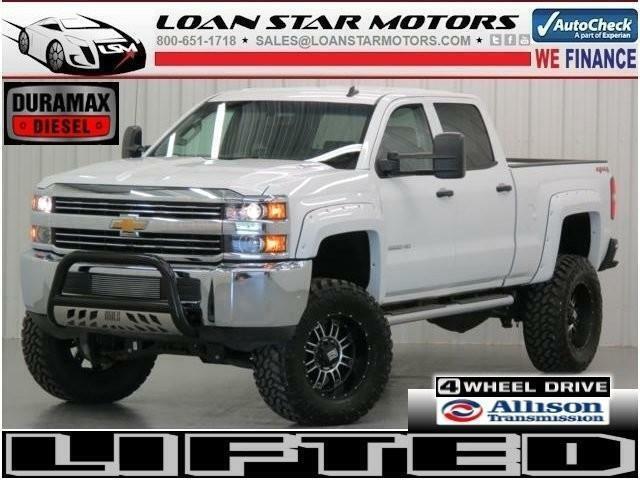 ***LIFTED***2015 Chevrolet Silverado 2500HD LT Crew Cab 6.6L Duramax Turbo Diesel 4WD LIFTED 4X4***ONE OWNER***100% AUTOCHECK GUARANTEED***LEATHER***FENDER FLARES***20 DEEP DISH XD SERIES WHEELS***37 NITTO MUD TIRES (37/13.50/20)***7.5 SUSPENSION LIFT KIT***RUNNING BOARDS***TOW MIRRORS***TOWING PACKAGE***BULL BAR***15K MILES***IF YOU'VE BEEN LOOKING FOR A NEW BODY DURAMAX TURBO DIESEL THAT'S LIFTED AND UNLIKE ANY OTHER ON THE MARKET, THEN YOUR SEARCH IS OVER***WE FINANCE***WAC *** Visit our website at www.loanstarmotors.com t o view 60+ pictures of this vehicle ***WE FINANCE***AS LOW AS 3.99% APR FINANCING ON QUALIFIED VEHICLES W.A.C. ***Another fine pre-owned vehicle offered for sale by Loan Star Motors of North Houston Humble TX * Contact our Sales Department for Complete Details at any Time at Toll Free *** 1- 800-651-1718 *** This Chevrolet includes: TRANSMISSION, ALLISON 1000 6-SPEED AUTOMATIC, ELECTRONICALLY CONTROLLED Transmission Overdrive Switch A/T 6-Speed A/T ENGINE, DURAMAX 6.6L TURBO DIESEL V8, B20-DIESEL COMPATIBLE Diesel Fuel 8 Cylinder Engine Turbocharged *Note - For third party subscriptions or services, please contact the dealer for more information. * Only the Autocheck can offer you the built-in peace of mind of knowing you made the right purchase. This well-maintained Chevrolet Silverado 2500HD LT Crew Cab 6.6L Duramax Turbo Diesel 4WD LIFTED 4X4 comes complete with a Autocheck one-owner history report. You appreciate the finer things in life, the vehicle you drive should not be the exception. Style, performance, sophistication is in a class of its own with this stunning Chevrolet Silverado 2500HD. This 4WD-equipped Chevrolet will handle majestically on any terrain and in any weather condition your may find yourself in. The benefits of driving an Four Wheel Drive vehicle, such as this Silverado 2500HD LT Crew Cab 6.6L Duramax Turbo Diesel 4WD LIFTED 4X4, include superior acceleration, improved steering, and increased traction and stability. This pre-owned Silverado 2500HD looks like new with a clean interior that's been well-kept. Intricately stitched leather and ergonomic design seats are among the details in which test drivers say that Chevrolet Silverado 2500HD is in a league of its own With new tires, this vehicle is ready for miles and miles of driving. An outstanding paint finish rounds out the wonderful aspects of this car. There are other vehicles and then there is the Silverado 2500HD LT Crew Cab 6.6L Duramax Turbo Diesel 4WD LIFTED 4X4. It is one of the most unique vehicles on the market, and you would be hard pressed to find another dealer offering something quite like this Chevrolet. Upgraded wheel package makes this Silverado 2500HD stand out from the rest. ***WE OFFER NATIONWIDE FINANCING OPTIONS * COMPETITIVE RATES, DISCOUNTED SHIPPING AND WELCOME TRADES * Extended Warranty Programs/Low APR Financing Available WAC. Physical Address: 5547 FM 1960, Humble TX, 77338-Toll Free 1-800-651-1718 - Visit us on the web at http://www.loanstarmotors.com All advertised prices exclude government fees and taxes, any finance charges, any dealer document preparation charge, and any emission testing charge. The price for listed vehicles as equipped does not include charges such as: License, Title, Registration Fees, State or Local Taxes, Dealer Prep, Smog Fees, Credit Investigation, Optional Credit Insurance, Physical Damage of Liability Insurance, or Delivery Fees. DEALER makes no representations, expressed or implied, to any actual or prospective purchaser or owner of this vehicle as to the existence, ownership, accuracy, description or condition of the listed vehicle's equipment, accessories, price, specials or any warranties. Any and all differences must be addressed prior to the sale of this vehicle. Your actual mileage will vary depending on how you drive and maintain your vehicle.